Fool me once, shame on you. Fool me twice...well, when it comes to specialty peeps, I’m just a fool who needs to feel to learn. Peeps. They’re adorable, sugary, marshmallow globs. They’re unholy as is. But when they’re flavoured and dipped in sorry excuses for fudge, it’s sacrilegious. And then when the fudge is flavoured! It’s just asking for punishment. Yesterday I asked for such punishment, and even though I pleaded for help—an intervention, even—none came to my aid. Except that one guy who sassed me. Where were the rest of you when I gazed hesitantly upon the Cherry Limeade Peep? It threatened to be sour. I took that as a challenge I didn’t really need to take. It’s Spring. I was feeling a renewed sense of daring. My memories were hibernating since that last meeting with Peeps. I should have known things would go awry. Never trust a peep who looks at you with such disdain. Unlike that one time back in Autumn when the Pumpkin Spice birds were close to being my undoing, luckily, I did not gag upon contact with the cherry limeade peep. Until I ate the sour green fudge. That was a different story. Fudge and I shouldn’t be enemies and yet the engineers at the Peep company insist on giving me a push towards ruining my friendship with it. Why, Peeps? Why would you do this? The fudge was (once again) strange. 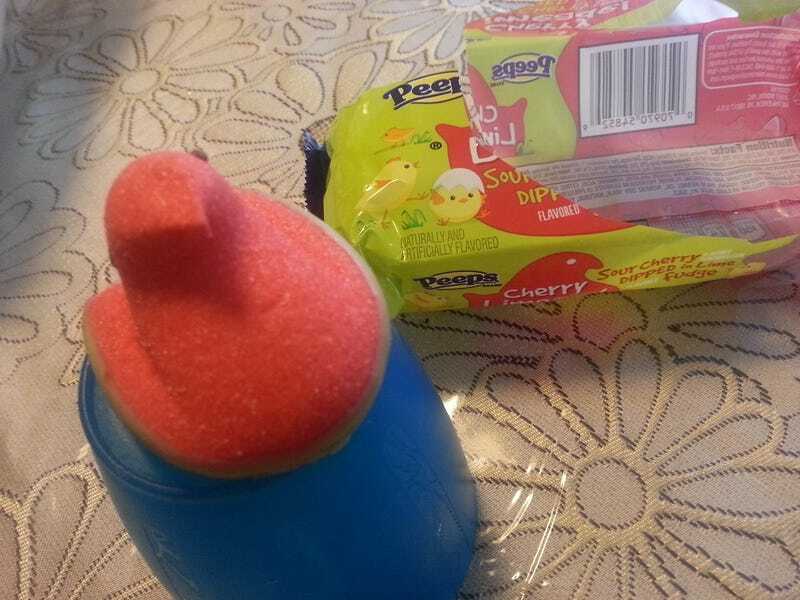 I had flashbacks of my last peep encounter, where the the texture was milky and unnatural. Here it was a milky lime which is making me feel slightly ill the more I think about it. There are some things that aren’t right in this world, and fudgey-bottom peeps is one of them. If I’m not back in 24 hours, send help. For real this time.